I am glad to see that Dan Graziano has begun writing his own blog, New York Baseball Hack, since his departure from the Star-Ledger. Dan is definitely one of the best baseball writers…in my opinion, and I always appreciate his insights. Dan expects the coming week to be quiet for the Yankees unless Andy Pettitte finally decides to re-sign with the team, and for Xavier Nady to be traded in Spring Training. As much as I love Andy Pettitte, I completely agree with the Yankees’ approach. I really think that no organization knows when to part ways with aging players like Boston, and now is the time for the Yankees to make one of those hard decisions. At this point in his career and given the current market, Andy is simply not a $10 million a year guy anymore. Those resources are better served elsewhere. With Phil Hughes, Ian Kennedy, Alfredo Aceves, and now Jason Johnson in reserve, the Yanks should try to take a chance on someone like Ben Sheets. My favorite quote today was by Yankee co-chairman Hal Steinbrenner: “If some owners are upset we invest in our team, I’m not going to lose any sleep over it.” I think Hal is proving to be a very capable leader for the organization. I kind of like those rumors of Trevor Hoffman potentially going to the Dodgers. It seems like a good fit. He makes his home in the area, and I don’t think Joe Torre wants to hand the full-time closer’s role to Jonathan Broxton just yet. Starting to see more rumors involving Xavier Nady so I suspect that he may be the odd man out. All things considered, I’d probably rather see Nick Swisher go since I think he is better suited for first base than an outfield position as evidenced by Chicago last year. It would be a shame for the Yankees half billion dollar investment to go array because of poor OF decisions this winter (I am sure that my Red Sox friends are losing sleep over that one! Ha!). Personally, I’d give a Hall of Fame Vote to Jim Rice if I could. 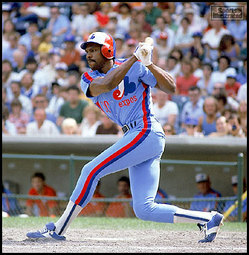 Regardless of what has been said, the fact remains that the guy was one of the most feared hitters of the 70’s.